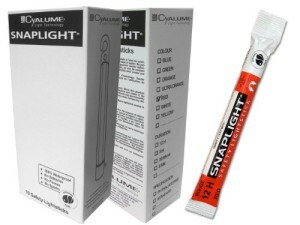 To activate a Cyalume® 6” SnapLight® lightsick, just bend, snap and shake. The SnapLight® lightstick will provide you a safe light without any risk of sparks or flames. To activate, bend the lightstick and shake it. Keep in original wrap until ready to use. Do not puncture or cut product. Ingredients may stain clothing or furniture. Contact with skin or eyes may cause temporary discomfort. In case of skin or eyes contact, rinse thoroughly with water. Do not drink or ingest contents. Do not leave product in direct sunlight or exposure to high temperatures. After use, dispose of in refuse container.